The anthropomorphic garbage fire, calling itself Al, held a press conference in the alleyway behind a New York City Denny's. 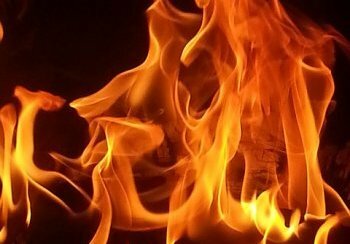 Many humans were taken aback by this sudden pronouncement of fires good will towards all, wondering if the inherent nature of fire to burn could really be trusted near anything that is quite flammable. Local human of Earth Gregor Neskov had a very lukewarm response to the claims made by Al. “Just 40 minutes ago I lit a cigarette and burnt my thumb with the lighter, I guess I'll know the truth in 20 minutes when I get another cigarette.” After 20 minutes Gregor was not only able to light his cigarette but was spared a gruesome inferno of a death when his still lit Zippo fell out of his hand and into a puddle of petrol he had spilled while refueling at a gas station. Another human, Kyle Barnes, reported “I was lighting fireworks when I heard the news, so I decided to go ahead and get a closer look at the sparks from a large fountain that I had lit, now half my face hurts real bad.” Many lesser consciousnesses of the fire amalgamation were quick to point out that indeed not all things are fire, and fireworks are especially not fire because of the heavily refined chemicals used in them. ”It's really confusing,” said Pamela Hinamori. “If this creature is part of some Great Combustion Life Form, then why would certain fires burn and others not? all fire is combustion!” Accidents from careless uses of fire near highly combustible material have skyrocketed in the past few days. “I just fear that I might be the one that pays when a neighbor in my apartment complex decides to leave a candle unattended, BBQ indoors, or try their hands at killing bugs with hairspray and a lighter because some odious smoke monster told them being that careless was okay.” Many lesser consciousnesses took to twitter to discredit Pamela's remarks and voiced their dismay at being called smoke monsters, reminding people that just because there's fire, doesn't mean there's smoke. When pressed by those leery of the proclamation, Al released an additional statement. Many have expressed doubts over the altruistic nature of Al's statements, from absolute terror of the mere existence of such a being, to what will become of firefighters. Others have expressed optimism in what this new entity might bring to the table and curiosity in the unanswered science of how a dumpster fire became sentient. These comments make me have to cathterise myself with a long dead rodent. OK write up, but marred by superficial errors that make the majority of it barely readable. There are all sorts of reasons to loathe you, and this is one. Steal your ideas much? YOU KNOW WHEN YOU TURN ON THE RADIO AND THERE ARE SONG LYRIC'S IN YOUR HEAD... THATS LIKE THIS MOMENT. WHATEVER YOU SAY, BISCUIT CHEESE.